Todolwen: Last Week Sunday ~ Treasure No. 3 ..
today's post is about my third and last treasure I found this last week Sunday. I thought this would the finale one of my 'Last Sunday' posts but it's not. There will be the last post about my Last Week Sunday's treasures tomorrow. 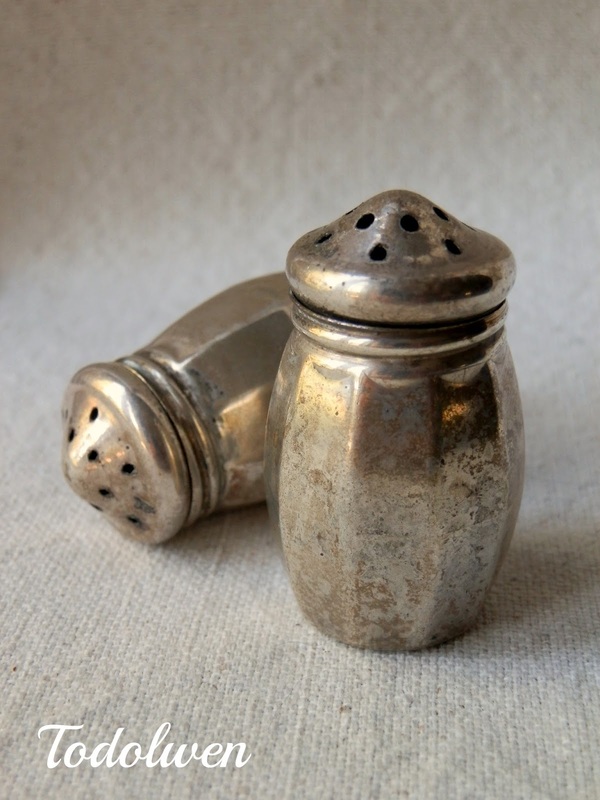 If you think about it properly, my last treasure is actually two treasures in the shape of a pair of old tarnished little silver salt and pepper shakers. The are so neat and small and only 1 3/4 inches tall. Of course pincushions again were one of my options to make but I wasn't quite sure if I wanted to make another one. Christmas and Winter popped into my mind as well but that was it really. In the end I just sat down and let my mind fly away to the land of creative thoughts and suddenly it just came very easily to me what I wanted to make from this finding. 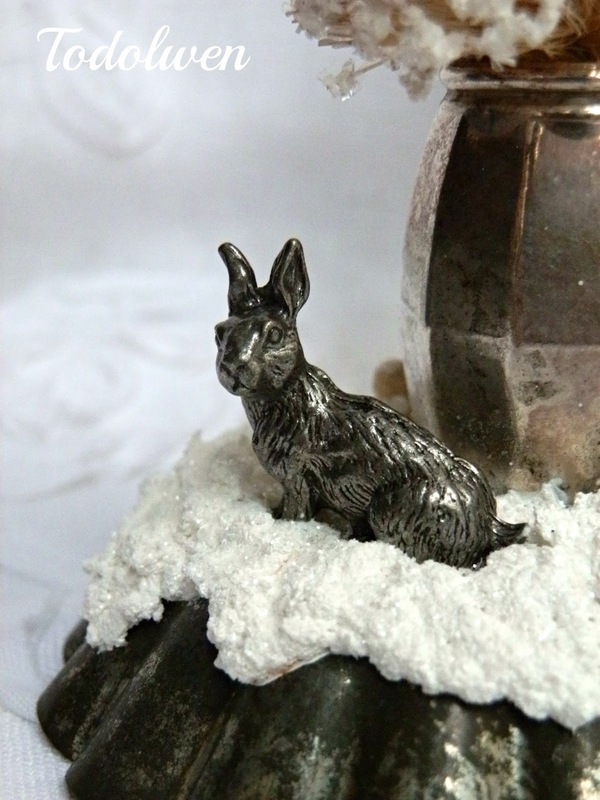 Do you all remember my little tiny pewter animals? 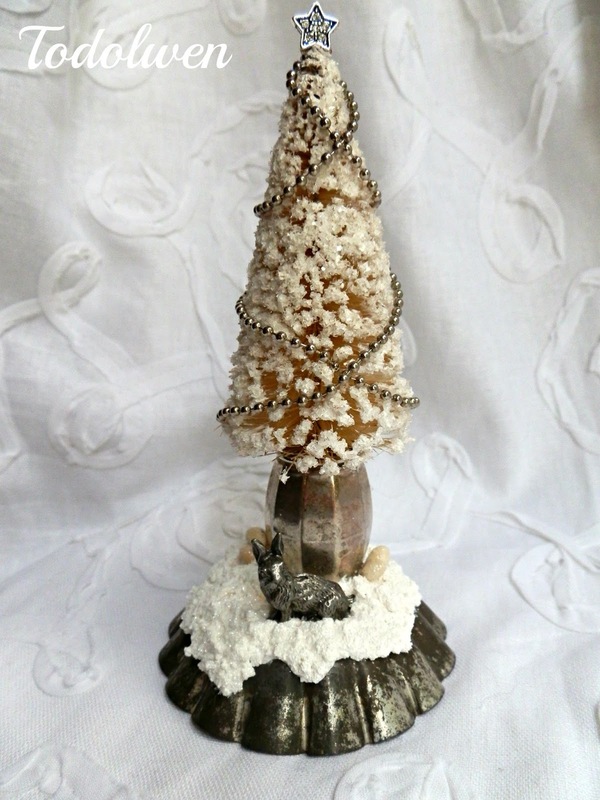 ... My stash of them is getting smaller but I just had to make these a part of at least one of these creations as well. Once they are gone, I won't be able to get anymore that I know of right now. Also a neat thing about this treasure is that I wasn't just able to make one creation from it. No, ... I made four and three of them ended up being Christmas/Winter themed. ... here they are the first two of my four latest creations and I hope you will enjoy them. 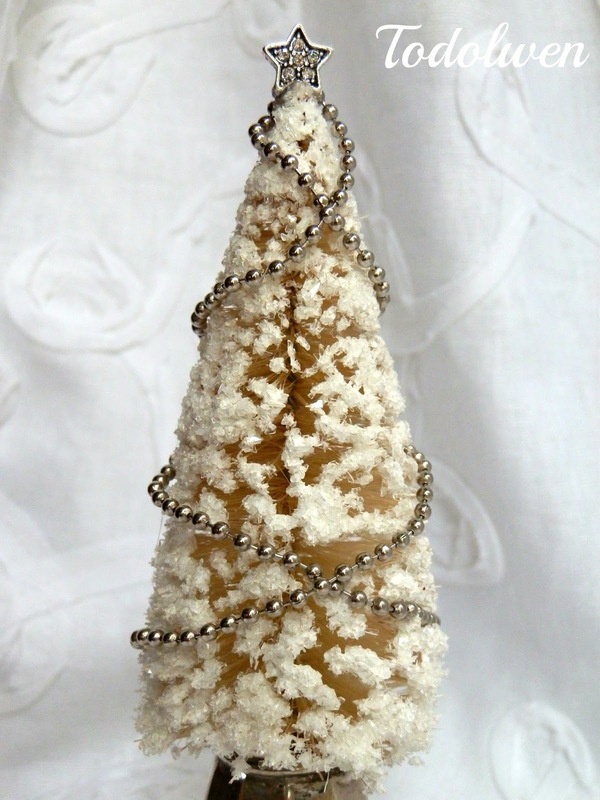 ... a little Christmas/Winter magic. 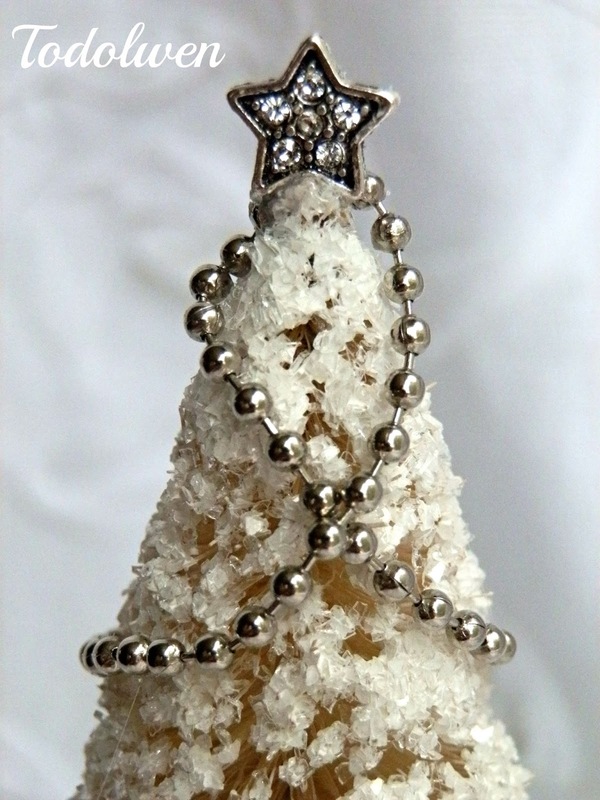 The little tree top star is embedded with Swarovski crystals which make it glisten in the light. 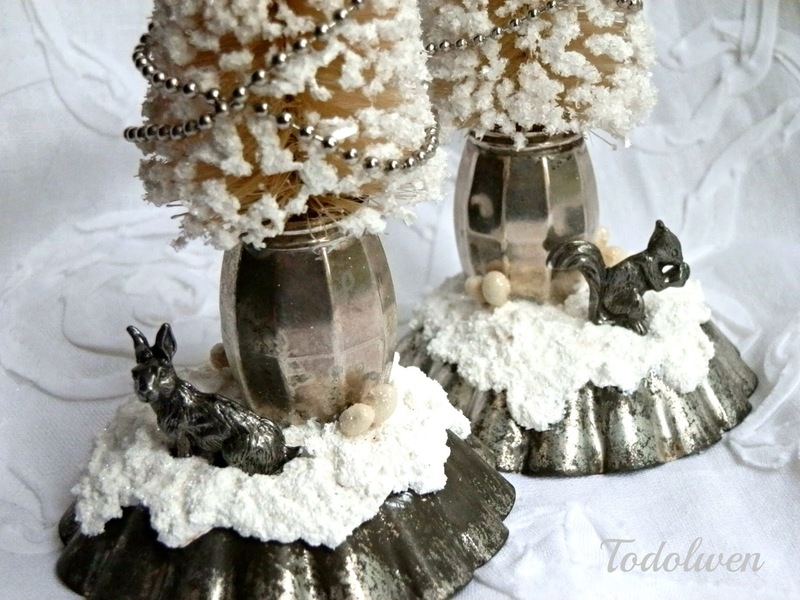 My little Christmas creations have turned very nicely in my eyes and I hope you like them too. Already I am thinking about what I could create next and already I have an idea too and I can't wait to start working on it. What are you up to these days? 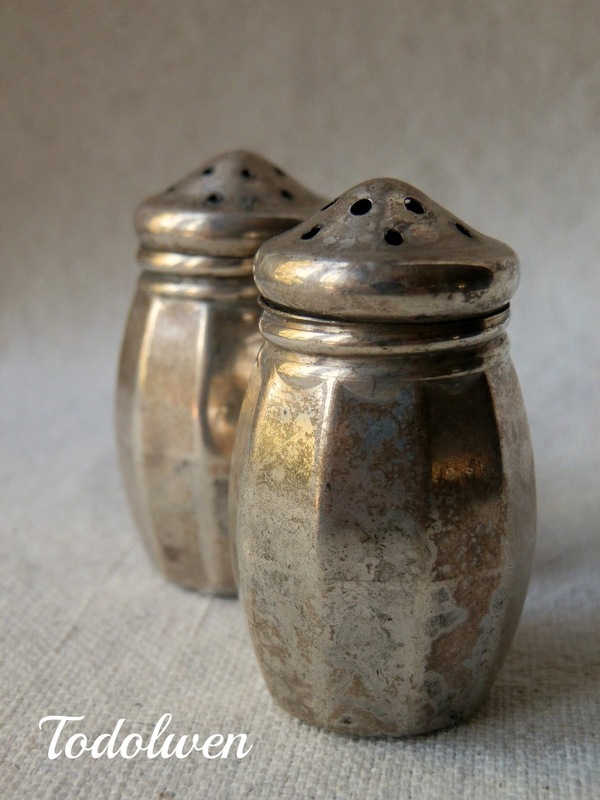 I just picked up a pair of beautiful tarnished silver salt & peppers, not knowing what I might ever do with them. I had thought of using them as holders for glitter. Oh my........you always come up with wonderful treasures! 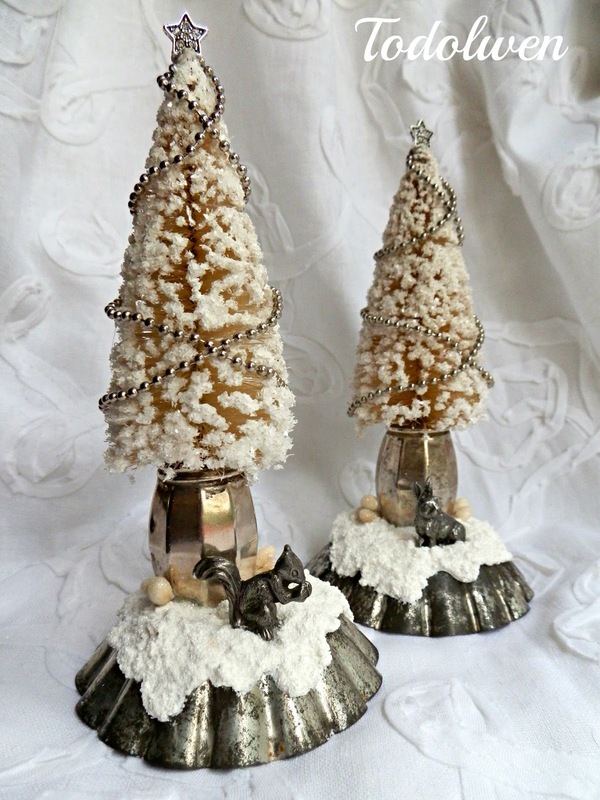 I love these little trees............your creativity amazes me. Karen! Your creativity never ceases to amaze me! 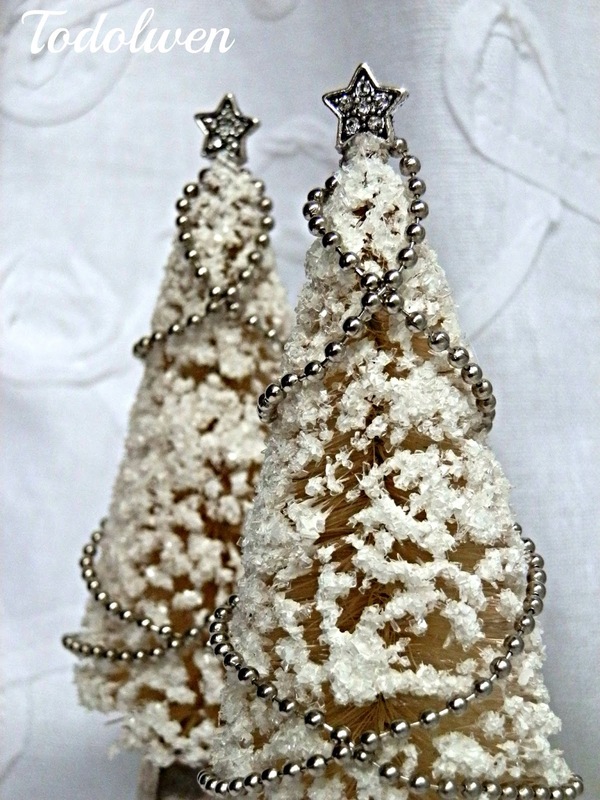 I would have never thought of making those into Christmas trees. I look forward to see what you come up with next. Bless you! How wonderful these are! 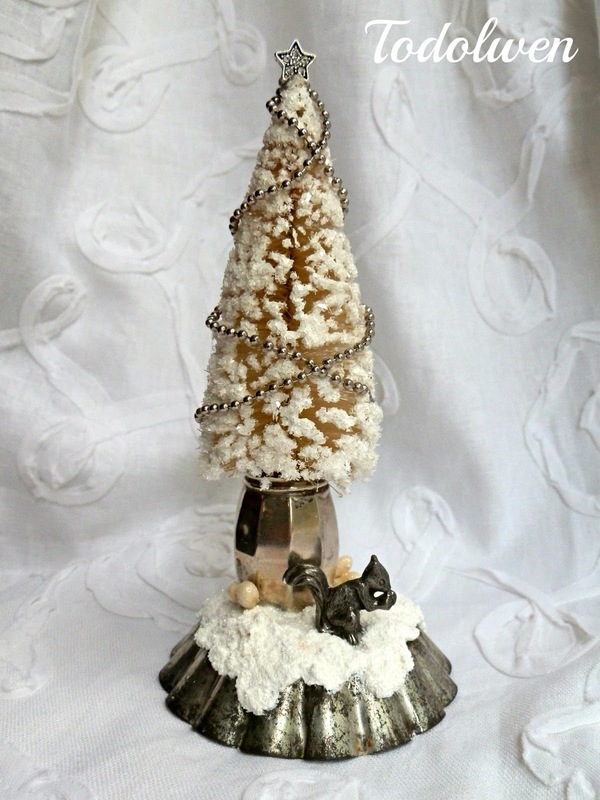 Maybe you would like to see what someone else did with their tiny salt and pepper shakers: http://mysalvagedtreasures.blogspot.com/2014/08/salt-pepper-shaker-necklaces.html This is another blog I follow. There are so many talented people in the world, and I follow some of them! What treats for my eyes! Enjoy! These are just so precious. Continually amazed, Karen. Love, love, love your creation ♥! 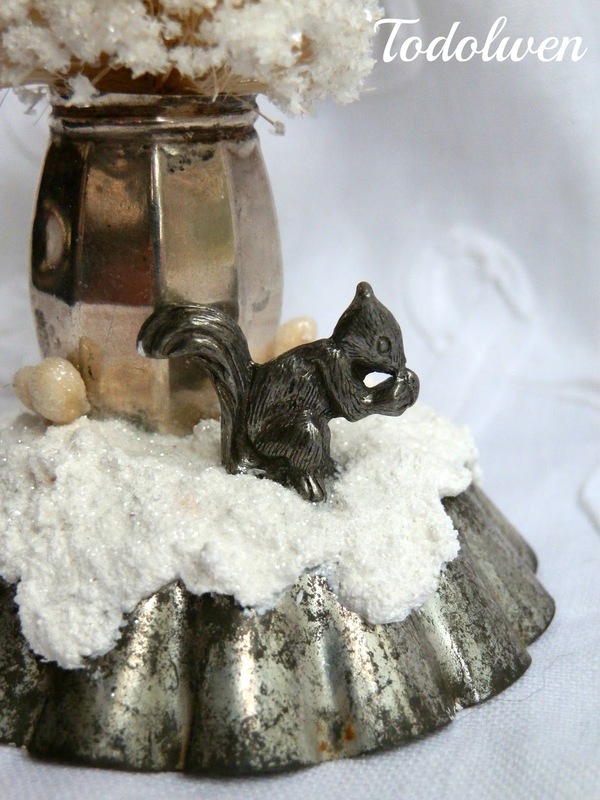 They are truly little magical winter creations, Oh I love them, and the sweetness of the tiny annimals in the snow ... BEAUTIFUL and adorable, dear Karen. I can't believe your little S&P's...I just bought 6 of them. 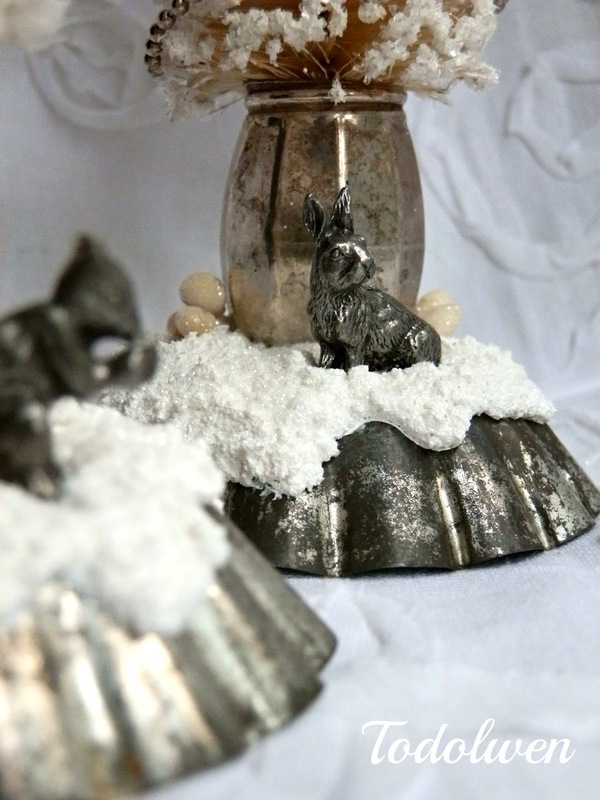 I make little snowmen on shakers but these seemed more special. I hope you don't mind that I make something similar to your little vignettes. 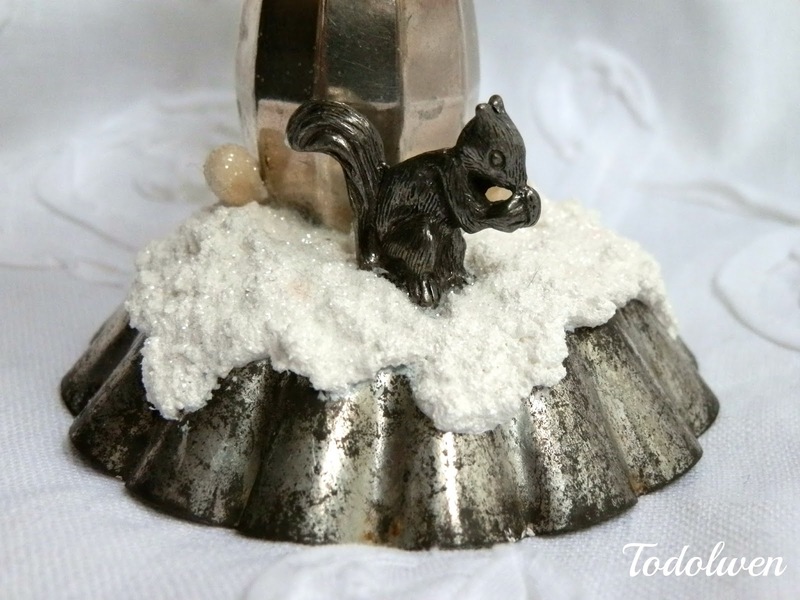 I have place the little bottle brush trees in silver sugar bowls and crochet spools and on candlesticks...so I'm hoping to find little trees for these little shakers. 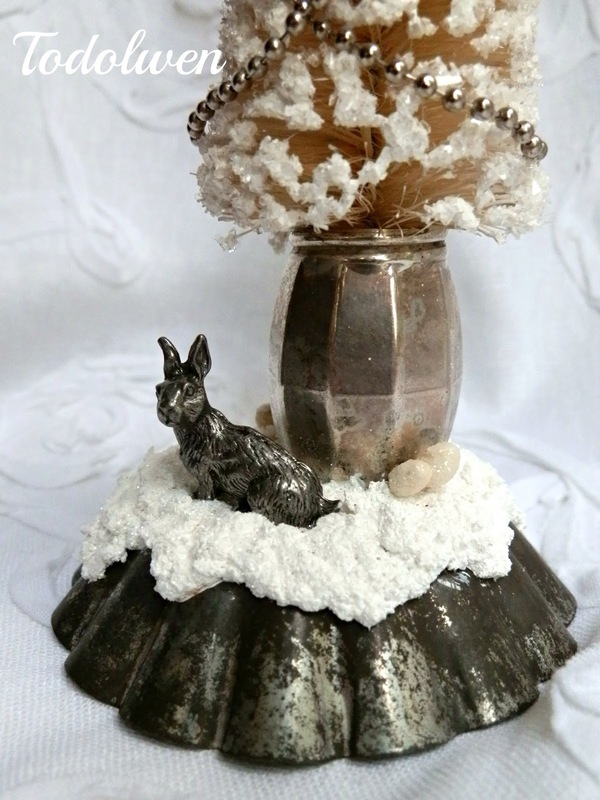 I just love your creations...they inspire me!